The Library is pleased to announce that a new online library catalogue system (Virtua Chamo) has been implemented recently for library users to search information of all the resources found in the Library. 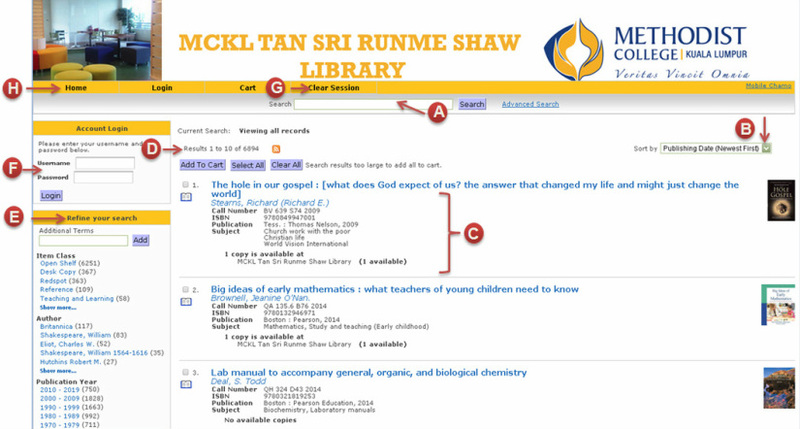 The library members can also check status of materials they have borrowed. To perform a new search, type your search term(s) into the Search box at the top of the Search Results screen and click the Search button. This default keyword search will perform a search of all of the indexed fields of the items. Note that not every word of every item record is searchable. If you do not succeed with your first search, try a ﻿new search term. To perform an advanced search, click the Advanced Search link at the top of the screen. To sort your search results, choose a sort criterion using the Sort By drop-down list box on the left side of the Search Results screen. You can choose either one. When your search results include more than 10 results (or your chosen number of results per page), navigation links to other pages of results appear as hyperlinked numbers and as "First," "Last," "Next," and "Previous" links on the bottom of the Search Results screen. Click these links to go to the Previous or Next page of results or to jump to a numbered page of results. Each page of results contains 10 entries by default. To view more information about an item, click on the item's title. The item details screen will be displayed. Your result hits will display here. The list of search facets on the left side of the Search Results screen can help you refine your search. These search facets are hyperlinks that let you narrow, or filter, your search results according to different categories of information such as author, subject, date and location. The numbers next to each facet indicate the number of items in your search results that match that search facet. To refine your search, click on a search facet. Your results list will be refined to include only those items in both your original search results AND the search facet categories you selected. The search facets you see will change as you change your search parameters. You can also refine your search by typing an additional search term in the "Additional Terms" search box and clicking the Add button. This performs a search that contains all of your previous search terms, filters, and facets as well as your new search term. To view your personal account information, you must login by using your username (Staff/students ID number) and password (IC/Passport number) for the first time. Then, you are allowed to change your own password. If you are logged in, you will see a Save button towards the upper right of the Search Results screen. Clicking the Save button saves the current search as your default search. This means that the next time you log in, the Search Results screen appears with the relevant search results. Like all search terms, your default search terms appear in the Current Search section of the Search Results screen. When you are finished, you can click the Clear Session link at the top of the page to clear your recent search history and the contents of your cart. The Clear Session link is only available to users who are not logged in. Logged-in patrons can clear their recent history by clicking the Logout link.